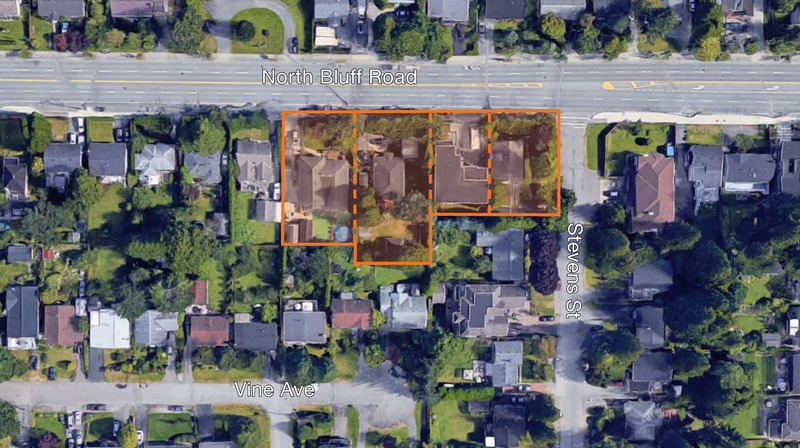 Positioned along North Bluff Road, this rare townhouse development opportunity in a municipality with very little townhouse supply, also fronts Stevens Street which will provide easy egress and ingress to the subject property. Frontage along North Bluff Road (16 Avenue) is approximately 289 feet with a gross site area of approximately 37,124 square feet. This site is well positioned between major access routes and local amenities, bringing an exceptional development opportunity in the highly sought after White Rock community. The property is steps away from Earl Marriott Secondary School, a short walk from Peace Arch Elementary School and less than 5 minutes away from the Semiahmoo Shopping Centre and 10 minutes from further shopping nodes including Grandview Corners and the Shops at Morgan Crossing in South Surrey. Public transportation is available immediately out front of the property along North Bluff Road and access is seamless to the commuter routes which include 152nd Street, King George Highway and Highway 99.